Snow be damned, mother Nature is not raining...eh, snowing on our parade of celebrating the loveliness that is spring footwear. 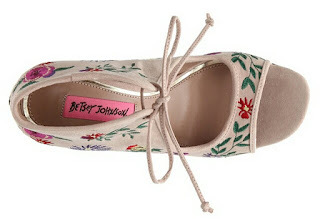 Today we're highlighting the chic Betsey Johnson Caira Pump. Since we'll be seeing florals blooming very soon, we figured this unique pump from Betsey Johnson is a perfect celebration of that. Featuring a faux suede upper with floral embroidery details, front tie closure, square peep toe, and a 4" covered heel, all in a fun and stylish silhouette. The best part, your feet won't be the only thing that'll be happy. 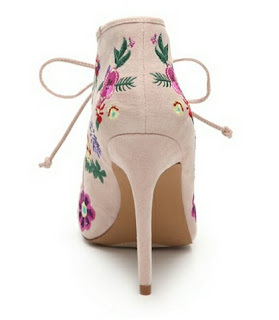 This darling retails for only $59.95 at www.dsw.com.